ANOTHER HANDSOME MANSION IN THE SAME BLUE AND WHITE COLOR SCHEME IN THE CITY CENTER. BUILT IN 1900. 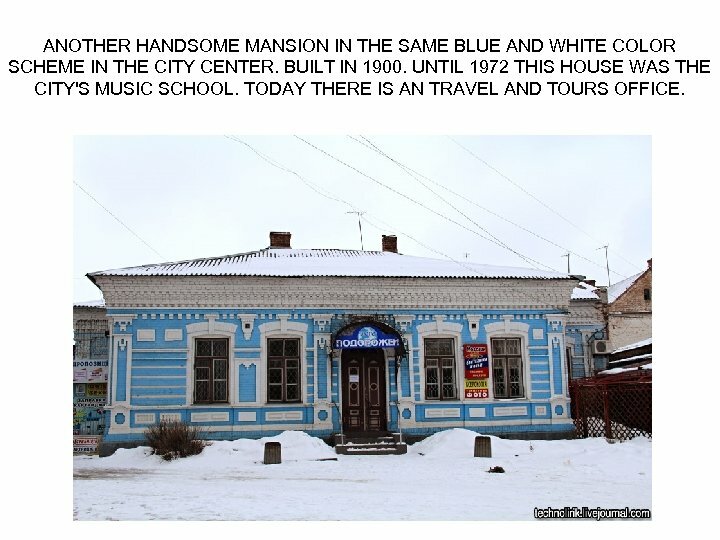 UNTIL 1972 THIS HOUSE WAS THE CITY'S MUSIC SCHOOL. TODAY THERE IS AN TRAVEL AND TOURS OFFICE. 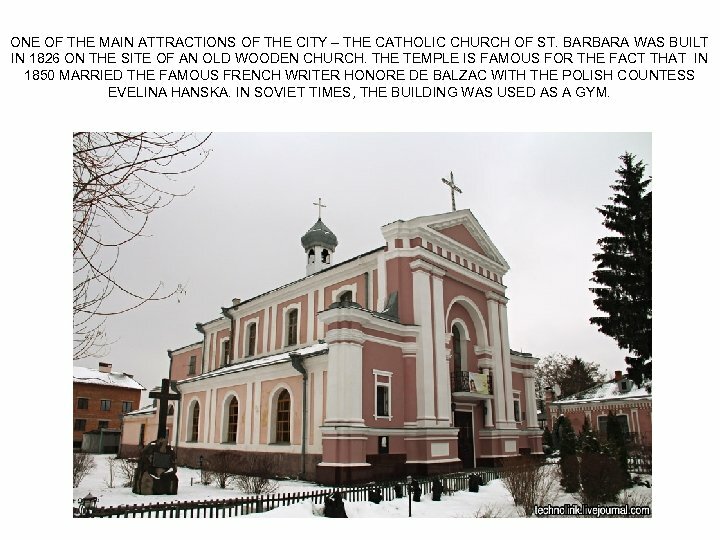 ONE OF THE MAIN ATTRACTIONS OF THE CITY – THE CATHOLIC CHURCH OF ST. BARBARA WAS BUILT IN 1826 ON THE SITE OF AN OLD WOODEN CHURCH. THE TEMPLE IS FAMOUS FOR THE FACT THAT IN 1850 MARRIED THE FAMOUS FRENCH WRITER HONORE DE BALZAC WITH THE POLISH COUNTESS EVELINA HANSKA. 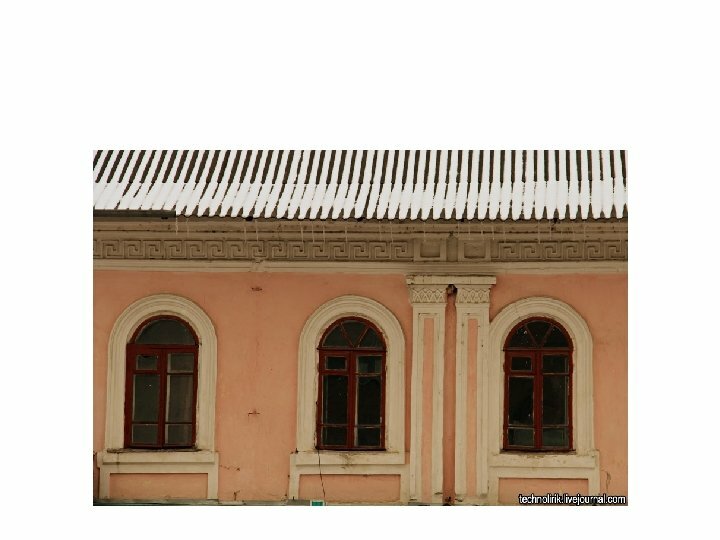 IN SOVIET TIMES, THE BUILDING WAS USED AS A GYM. 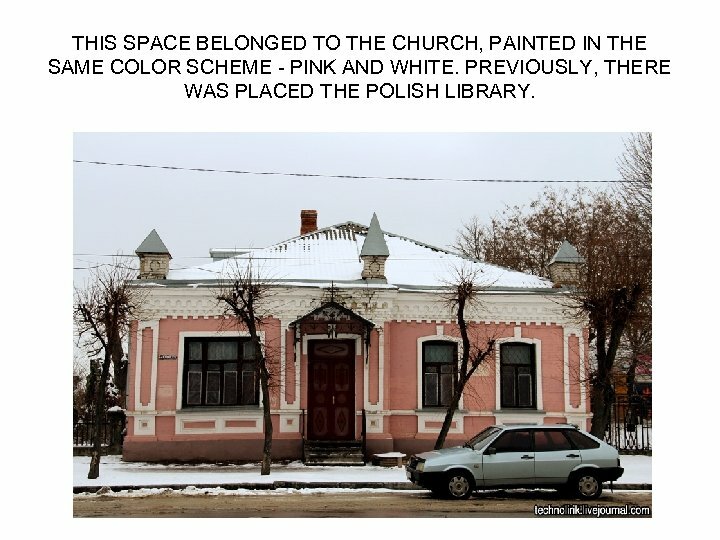 THIS SPACE BELONGED TO THE CHURCH, PAINTED IN THE SAME COLOR SCHEME - PINK AND WHITE. PREVIOUSLY, THERE WAS PLACED THE POLISH LIBRARY. OBSERVE THAT THE CANOPY AND THE RAILINGS WERE VERY WELL BUILT! 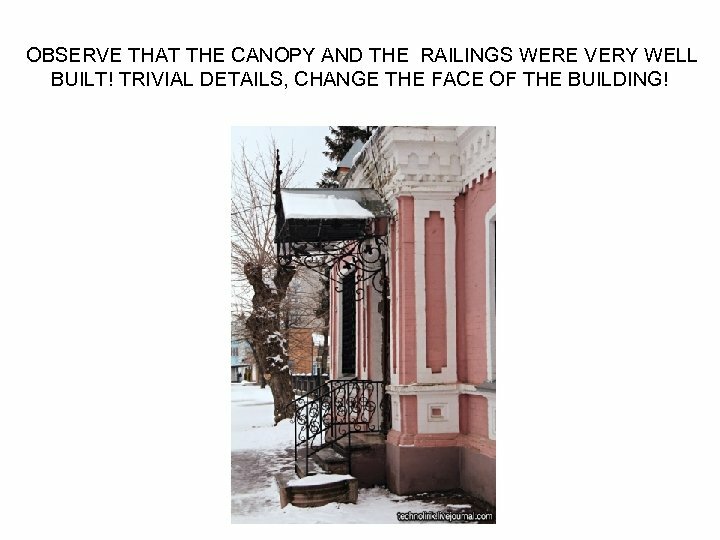 TRIVIAL DETAILS, CHANGE THE FACE OF THE BUILDING! 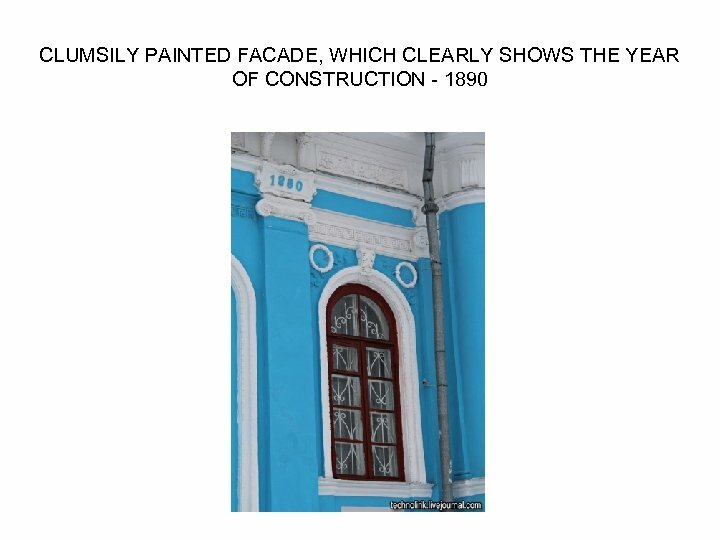 IN THE SAME COLOR ARE PAINTED SEVERAL IMPORTANT SIGHTS. 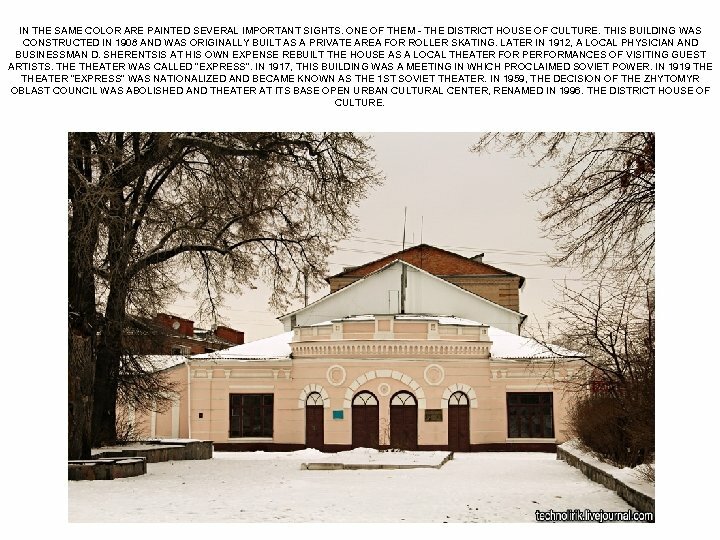 ONE OF THEM - THE DISTRICT HOUSE OF CULTURE. THIS BUILDING WAS CONSTRUCTED IN 1908 AND WAS ORIGINALLY BUILT AS A PRIVATE AREA FOR ROLLER SKATING. LATER IN 1912, A LOCAL PHYSICIAN AND BUSINESSMAN D. SHERENTSIS AT HIS OWN EXPENSE REBUILT THE HOUSE AS A LOCAL THEATER FOR PERFORMANCES OF VISITING GUEST ARTISTS. THEATER WAS CALLED "EXPRESS". 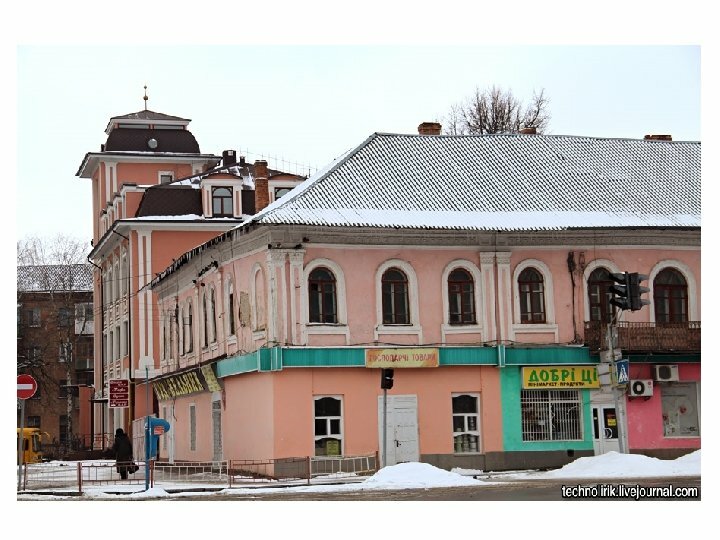 IN 1917, THIS BUILDING WAS A MEETING IN WHICH PROCLAIMED SOVIET POWER. IN 1919 THEATER "EXPRESS" WAS NATIONALIZED AND BECAME KNOWN AS THE 1 ST SOVIET THEATER. 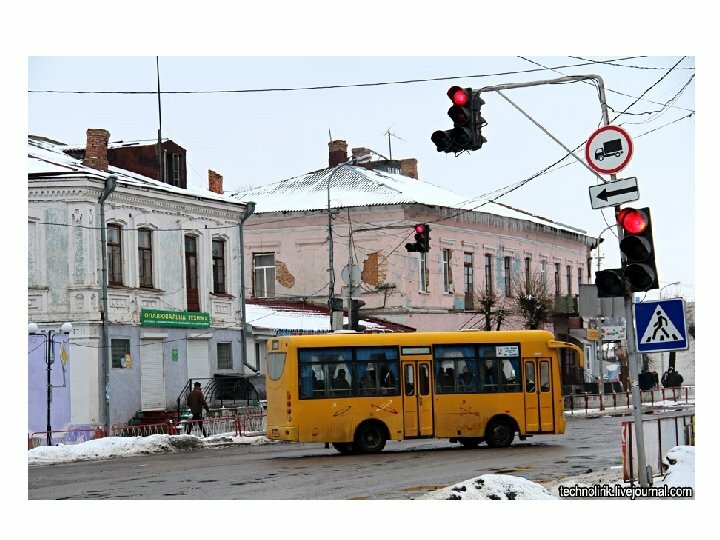 IN 1959, THE DECISION OF THE ZHYTOMYR OBLAST COUNCIL WAS ABOLISHED AND THEATER AT ITS BASE OPEN URBAN CULTURAL CENTER, RENAMED IN 1996. THE DISTRICT HOUSE OF CULTURE. ANOTHER BUILDING PINK AND WHITE. 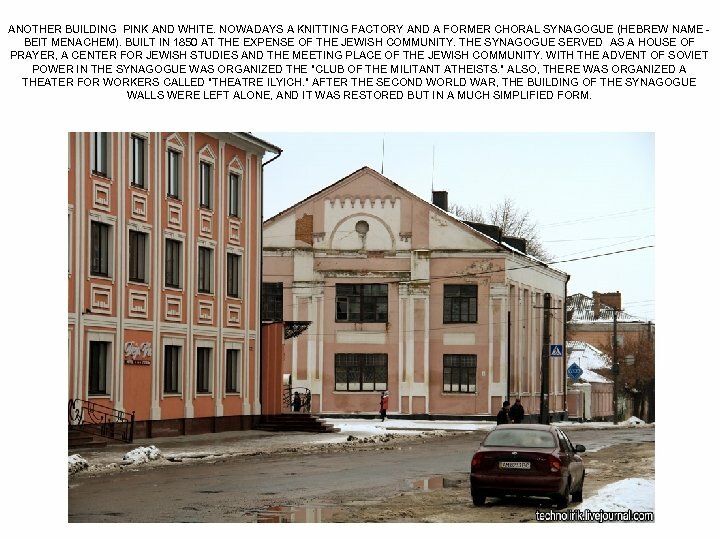 NOWADAYS A KNITTING FACTORY AND A FORMER CHORAL SYNAGOGUE (HEBREW NAME BEIT MENACHEM). 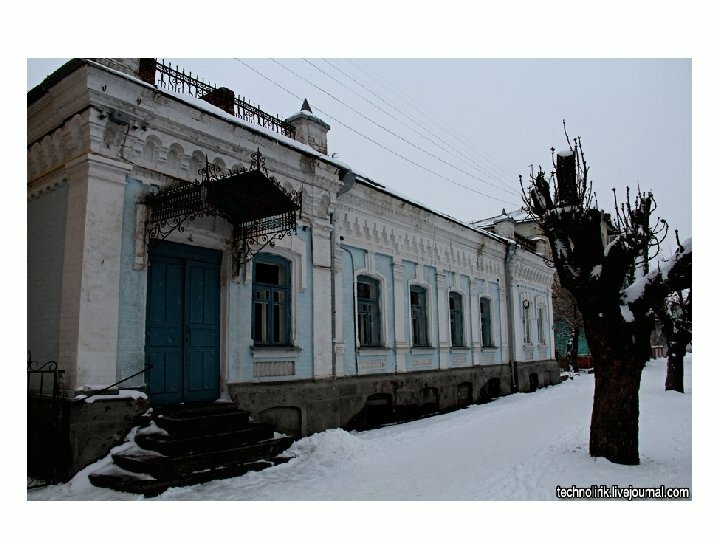 BUILT IN 1850 AT THE EXPENSE OF THE JEWISH COMMUNITY. 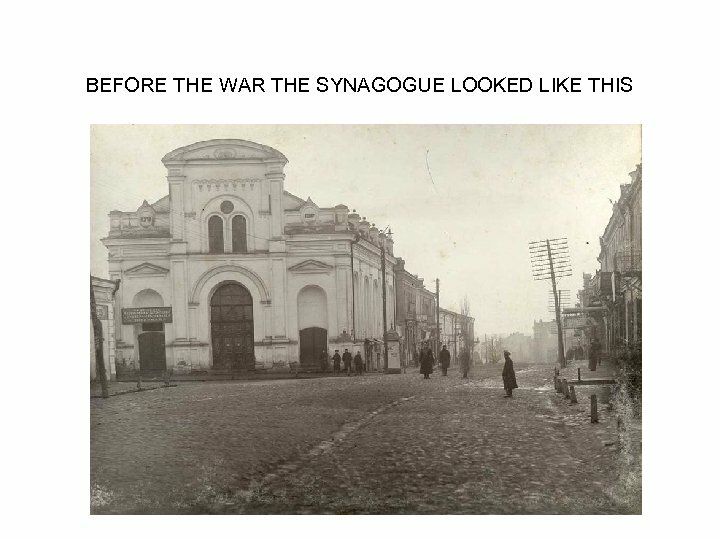 THE SYNAGOGUE SERVED AS A HOUSE OF PRAYER, A CENTER FOR JEWISH STUDIES AND THE MEETING PLACE OF THE JEWISH COMMUNITY. WITH THE ADVENT OF SOVIET POWER IN THE SYNAGOGUE WAS ORGANIZED THE "CLUB OF THE MILITANT ATHEISTS. " ALSO, THERE WAS ORGANIZED A THEATER FOR WORKERS CALLED "THEATRE ILYICH. " 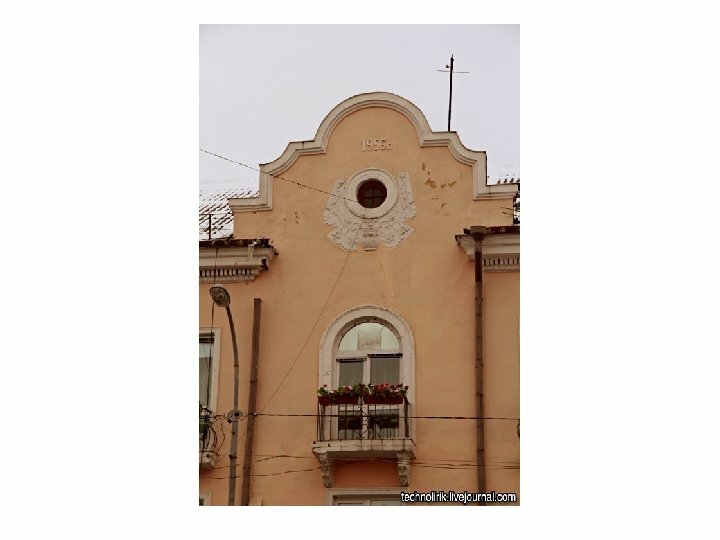 AFTER THE SECOND WORLD WAR, THE BUILDING OF THE SYNAGOGUE WALLS WERE LEFT ALONE, AND IT WAS RESTORED BUT IN A MUCH SIMPLIFIED FORM. VERY CLOSE TO THE BUILDING OF THE FORMER SYNAGOGUE THERE IS A SYNAGOGUE SERVING TODAY, BUILT IN 1895. 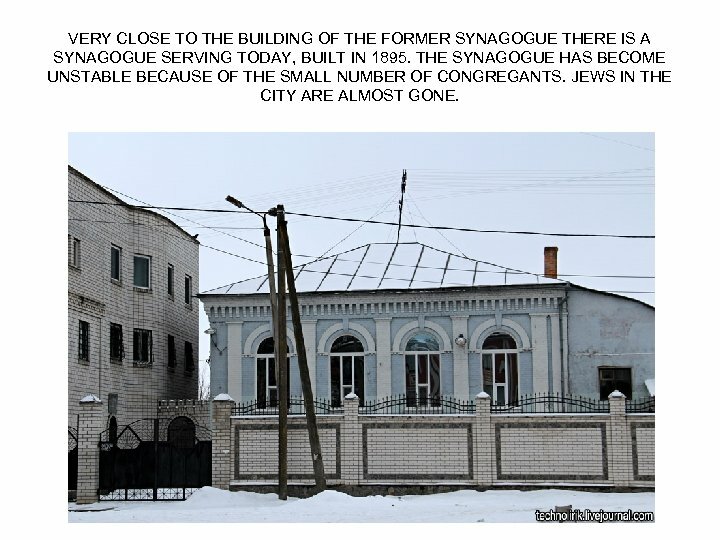 THE SYNAGOGUE HAS BECOME UNSTABLE BECAUSE OF THE SMALL NUMBER OF CONGREGANTS. JEWS IN THE CITY ARE ALMOST GONE. AGAIN, WHITE AND BLUE COLORS. 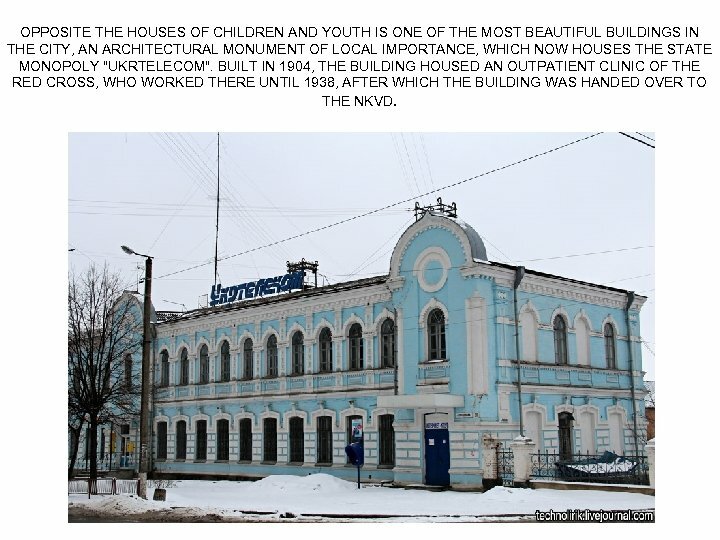 THE BUILDING, BUILT IN 1920, IS AN ARCHITECTURAL MONUMENT OF LOCAL IMPORTANCE. 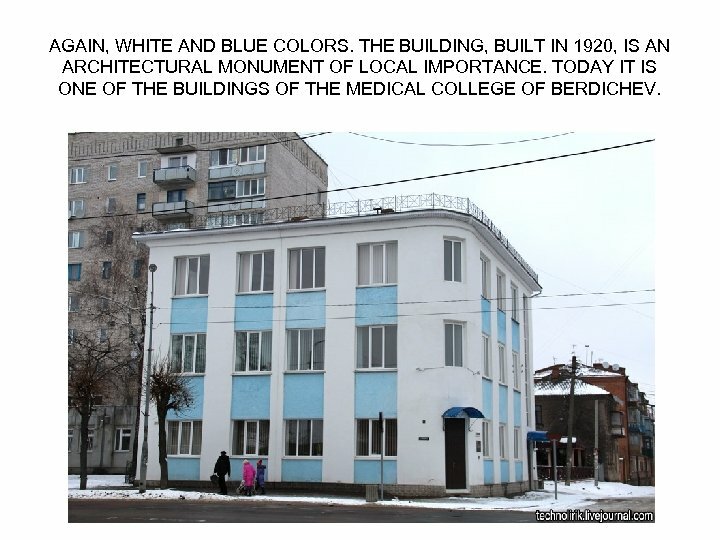 TODAY IT IS ONE OF THE BUILDINGS OF THE MEDICAL COLLEGE OF BERDICHEV. 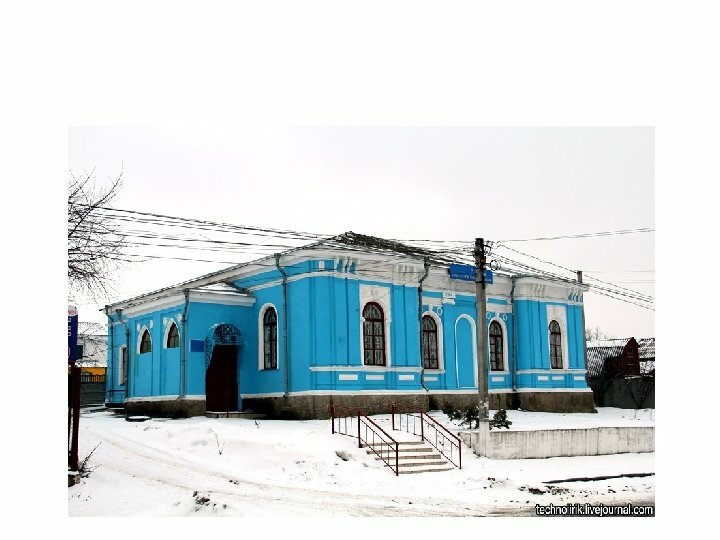 ANOTHER LOCAL ARCHITECTURAL MONUMENT IN WHITE AND BLUE SHADES. 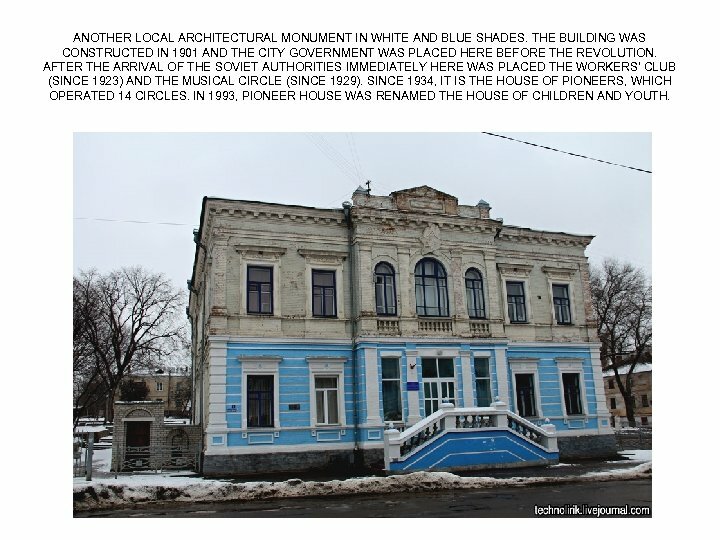 THE BUILDING WAS CONSTRUCTED IN 1901 AND THE CITY GOVERNMENT WAS PLACED HERE BEFORE THE REVOLUTION. AFTER THE ARRIVAL OF THE SOVIET AUTHORITIES IMMEDIATELY HERE WAS PLACED THE WORKERS' CLUB (SINCE 1923) AND THE MUSICAL CIRCLE (SINCE 1929). SINCE 1934, IT IS THE HOUSE OF PIONEERS, WHICH OPERATED 14 CIRCLES. IN 1993, PIONEER HOUSE WAS RENAMED THE HOUSE OF CHILDREN AND YOUTH. 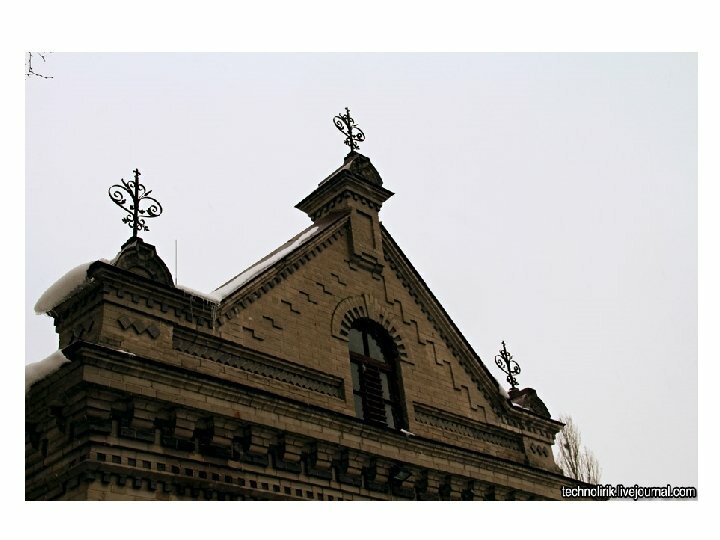 OPPOSITE THE HOUSES OF CHILDREN AND YOUTH IS ONE OF THE MOST BEAUTIFUL BUILDINGS IN THE CITY, AN ARCHITECTURAL MONUMENT OF LOCAL IMPORTANCE, WHICH NOW HOUSES THE STATE MONOPOLY "UKRTELECOM". 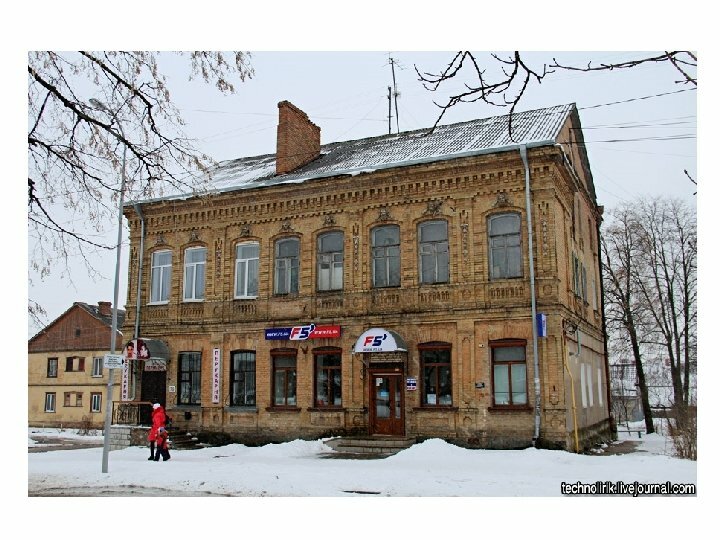 BUILT IN 1904, THE BUILDING HOUSED AN OUTPATIENT CLINIC OF THE RED CROSS, WHO WORKED THERE UNTIL 1938, AFTER WHICH THE BUILDING WAS HANDED OVER TO THE NKVD. 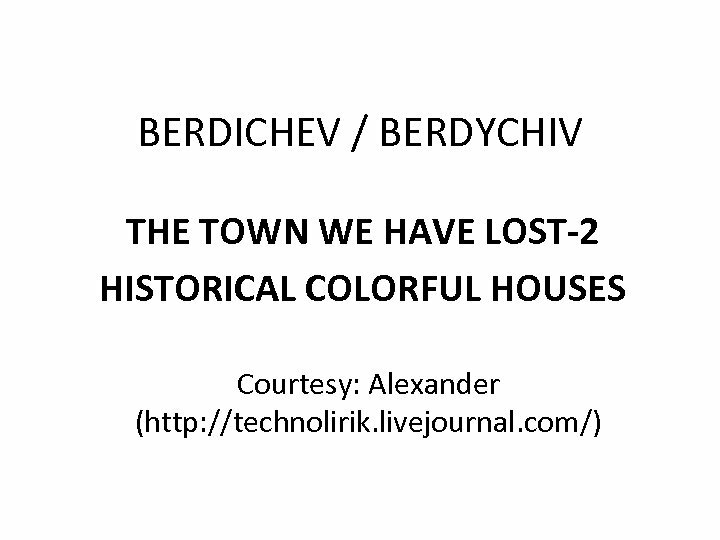 ONE OF THE OLDEST SURVIVING HOUSES OF BERDICHEV. THE BUILDING WAS BUILT IN 1846, IT WAS THE MAGISTRATE'S COURT - THE COURT WITH A SUMMARY JUDGMENT TO CONSIDER MINOR CIVIL CASES AND MINOR CRIMINAL OFFENSES. 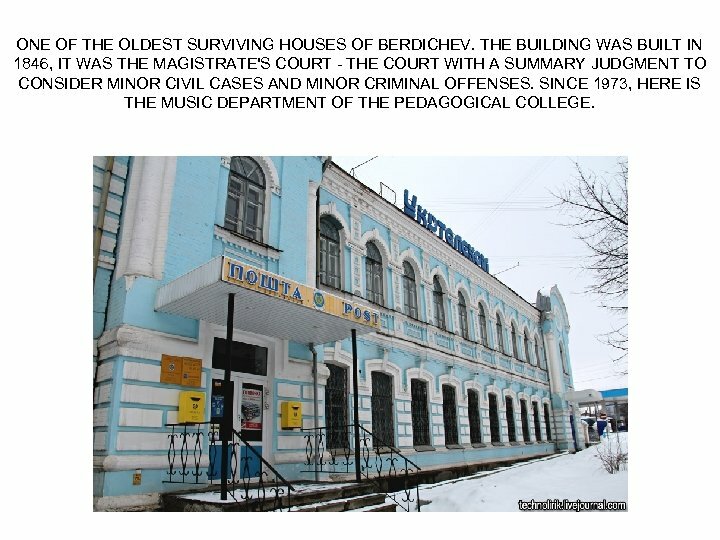 SINCE 1973, HERE IS THE MUSIC DEPARTMENT OF THE PEDAGOGICAL COLLEGE. 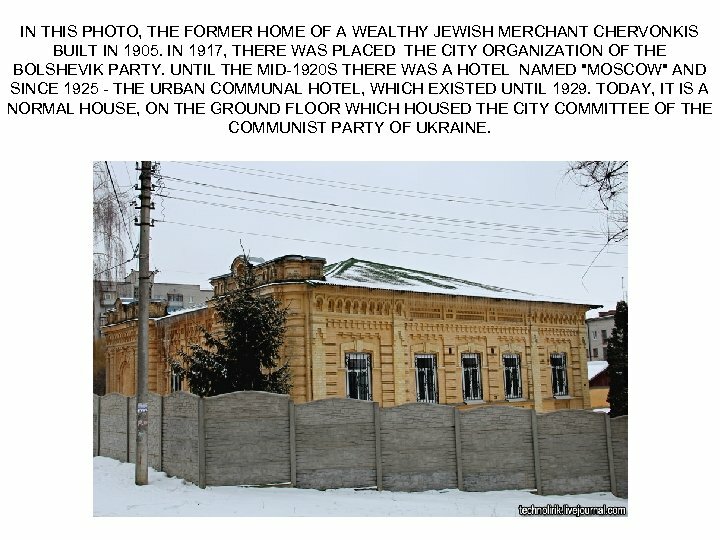 IN THIS PHOTO, THE FORMER HOME OF A WEALTHY JEWISH MERCHANT CHERVONKIS BUILT IN 1905. IN 1917, THERE WAS PLACED THE CITY ORGANIZATION OF THE BOLSHEVIK PARTY. 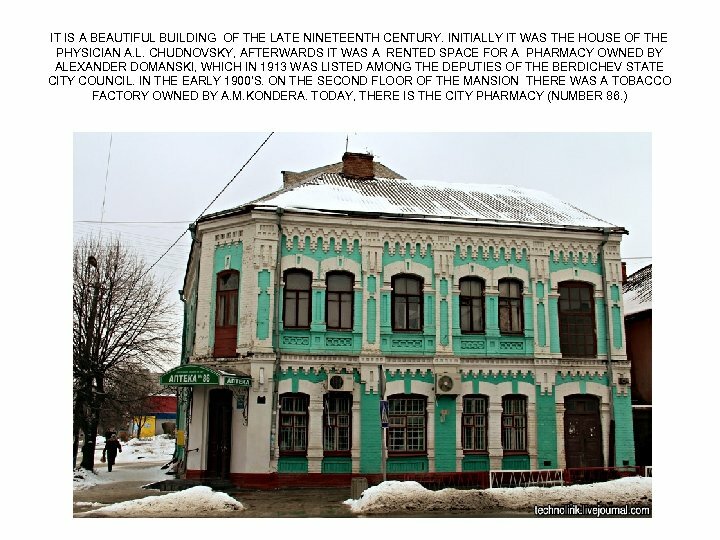 UNTIL THE MID-1920 S THERE WAS A HOTEL NAMED "MOSCOW" AND SINCE 1925 - THE URBAN COMMUNAL HOTEL, WHICH EXISTED UNTIL 1929. 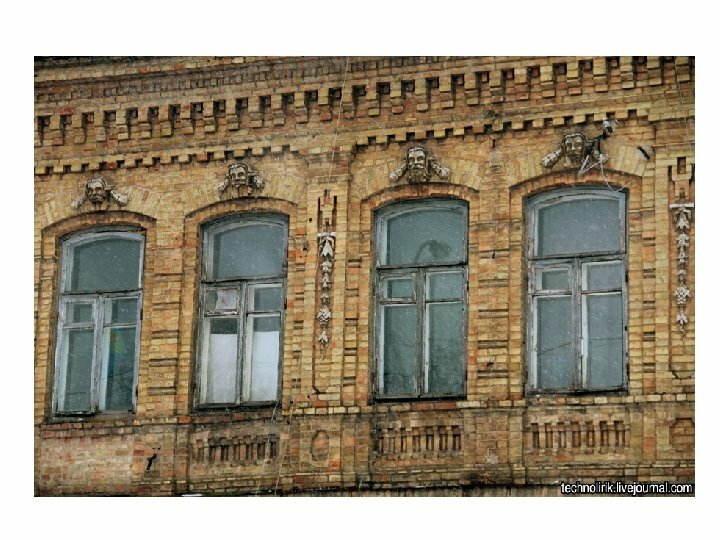 TODAY, IT IS A NORMAL HOUSE, ON THE GROUND FLOOR WHICH HOUSED THE CITY COMMITTEE OF THE COMMUNIST PARTY OF UKRAINE. 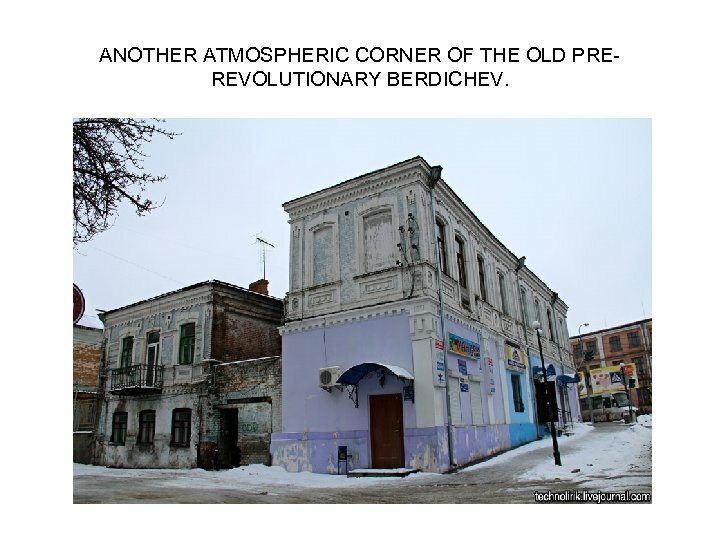 ANOTHER ATMOSPHERIC CORNER OF THE OLD PREREVOLUTIONARY BERDICHEV. OLD HOUSE BUILT IN THE EARLY 1900'S ON THE MAIN STREET OF THE CITY. ON THE WALL YOU WILL NOTICE A SMALL NICHE. IN SOVIET TIMES, IN AN ALCOVE WERE HUNG ALL THE ORDERS OF THE CITY ADMINISTRATION OF THE UKRAINIAN GOVERNMENT. THIS NICHE HOUSE OWES ITS LOCATION IN THE CENTER OF THE CITY. 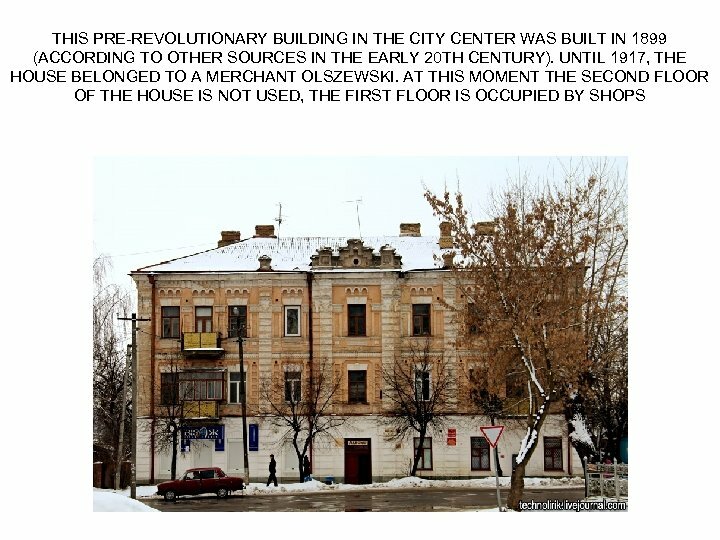 ANOTHER INTERESTING AND WELL-PRESERVED EXAMPLE OF URBAN PREREVOLUTIONARY ARCHITECTURE. THIS MANSION WAS BUILT IN 1902. 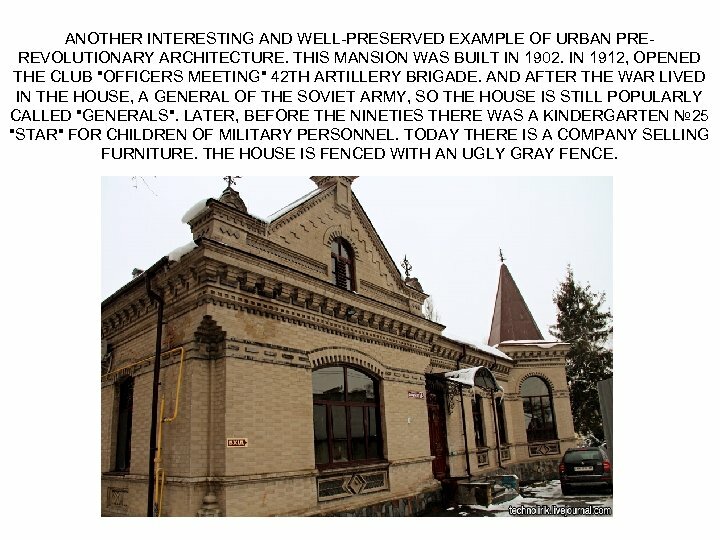 IN 1912, OPENED THE CLUB "OFFICERS MEETING" 42 TH ARTILLERY BRIGADE. 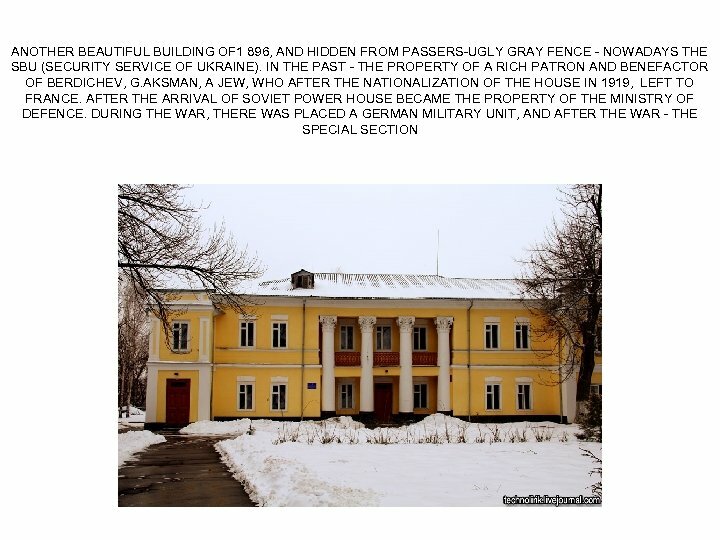 AND AFTER THE WAR LIVED IN THE HOUSE, A GENERAL OF THE SOVIET ARMY, SO THE HOUSE IS STILL POPULARLY CALLED "GENERALS". LATER, BEFORE THE NINETIES THERE WAS A KINDERGARTEN № 25 "STAR" FOR CHILDREN OF MILITARY PERSONNEL. TODAY THERE IS A COMPANY SELLING FURNITURE. THE HOUSE IS FENCED WITH AN UGLY GRAY FENCE. 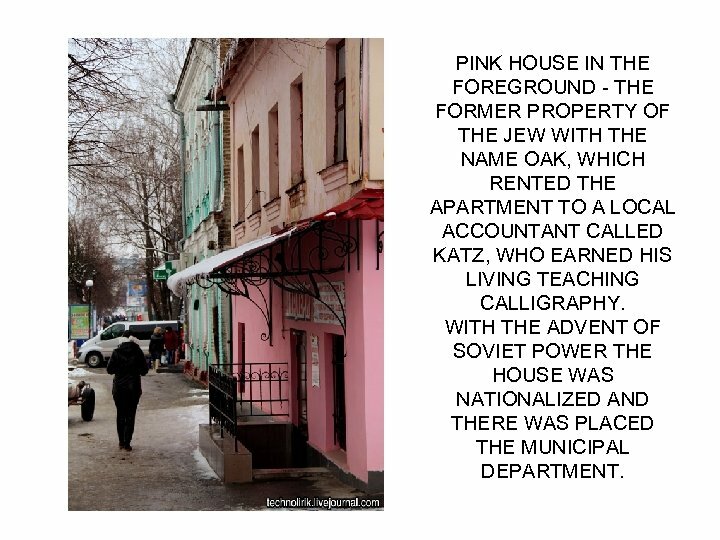 PINK HOUSE IN THE FOREGROUND - THE FORMER PROPERTY OF THE JEW WITH THE NAME OAK, WHICH RENTED THE APARTMENT TO A LOCAL ACCOUNTANT CALLED KATZ, WHO EARNED HIS LIVING TEACHING CALLIGRAPHY. 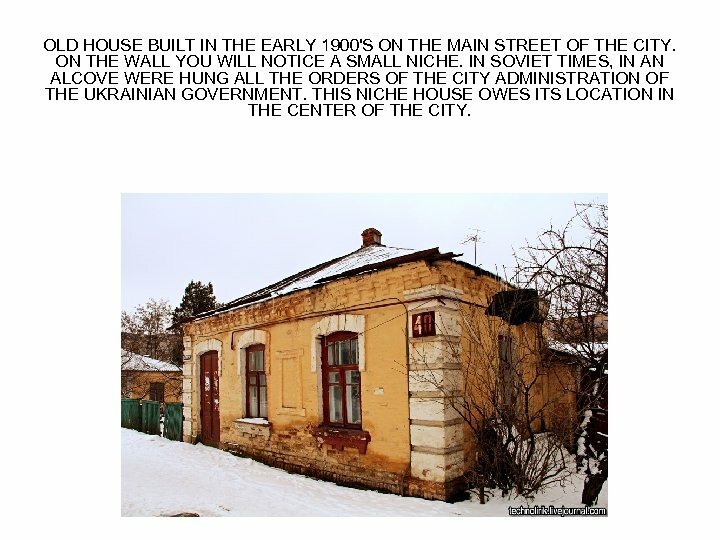 WITH THE ADVENT OF SOVIET POWER THE HOUSE WAS NATIONALIZED AND THERE WAS PLACED THE MUNICIPAL DEPARTMENT. 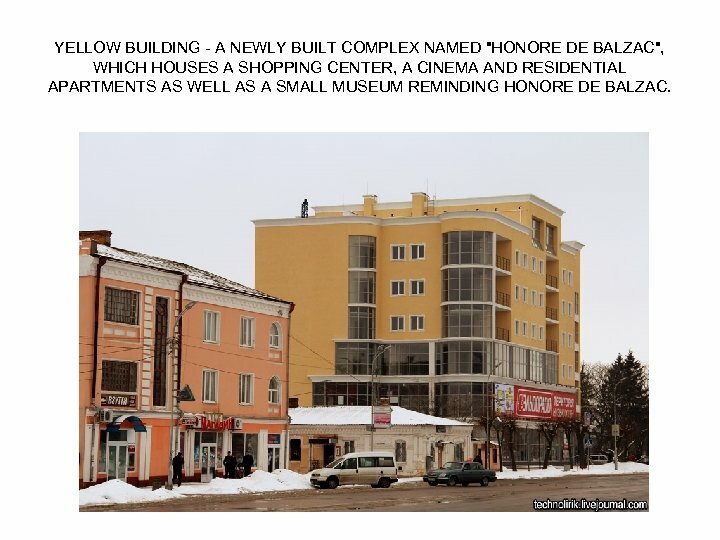 YELLOW BUILDING - A NEWLY BUILT COMPLEX NAMED "HONORE DE BALZAC", WHICH HOUSES A SHOPPING CENTER, A CINEMA AND RESIDENTIAL APARTMENTS AS WELL AS A SMALL MUSEUM REMINDING HONORE DE BALZAC. 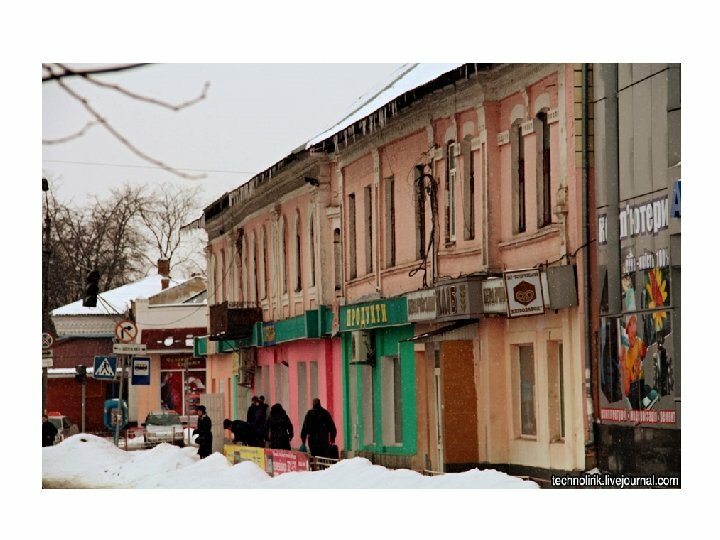 BERDICHEV - A CITY WITH A RICH PAST, WHICH KEPT A LOT OF BEAUTIFUL AND ATMOSPHERIC ARCHITECTURE. 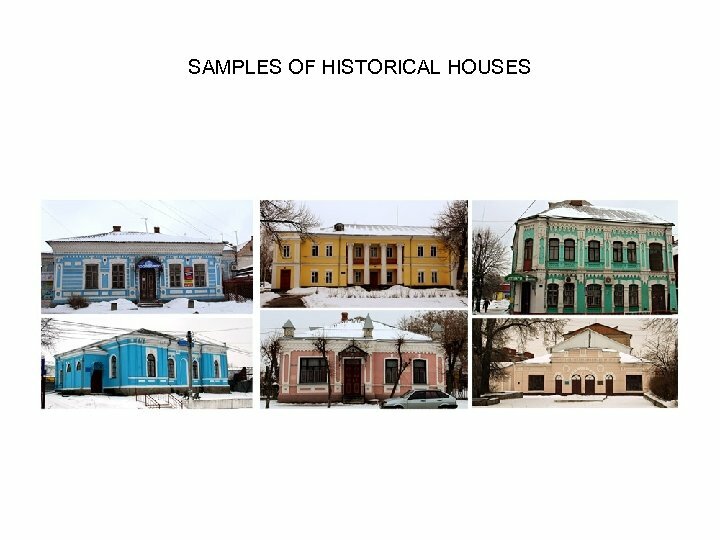 EACH OF THESE HOUSES BREATHES HISTORY AND CREATES A CITY FLAVOR AND A UNIQUE ATMOSPHERE. 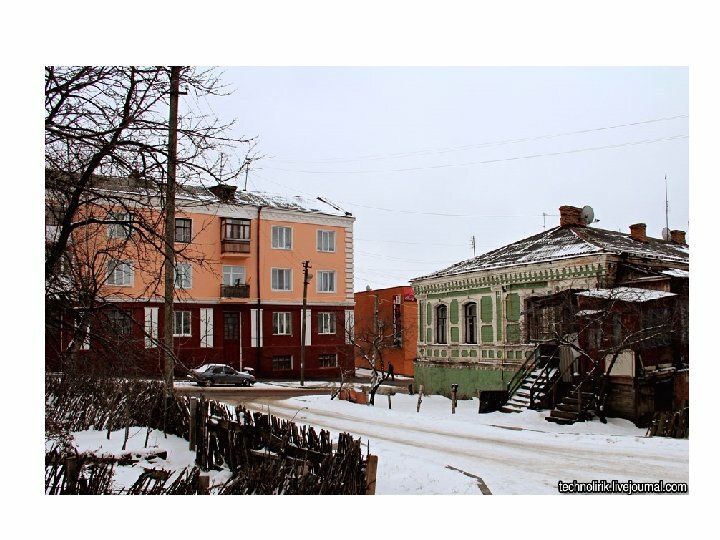 EVERY YEAR, THESE HOMES ARE BECOMING INCREASINGLY DILAPIDATED, AND WHEN THEY COME TO THE EMERGENCY STATE SIMPLY DEMOLISHED. 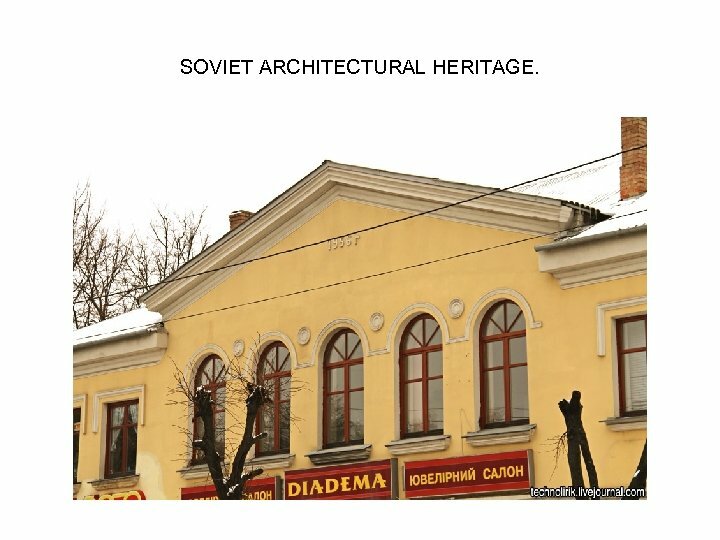 OVER THE PAST DECADE, THE CITY LOST A LOT OF ITS ARCHITECTURAL HERITAGE AND CONTINUES TO LOSE IT EVERY YEAR. 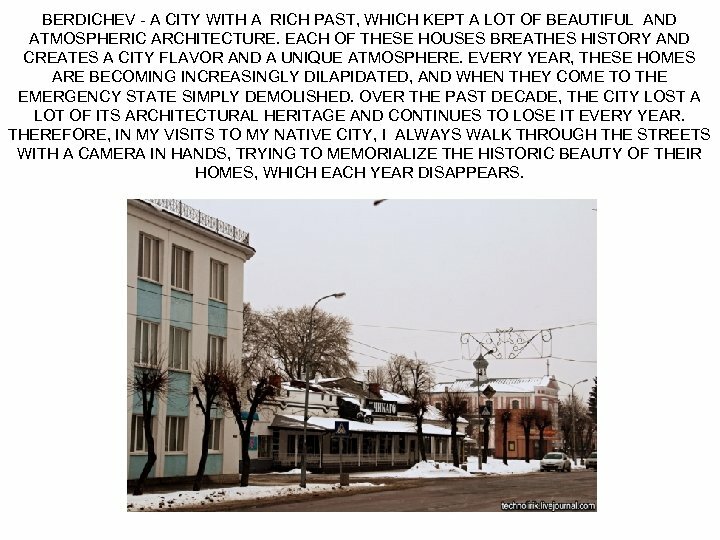 THEREFORE, IN MY VISITS TO MY NATIVE CITY, I ALWAYS WALK THROUGH THE STREETS WITH A CAMERA IN HANDS, TRYING TO MEMORIALIZE THE HISTORIC BEAUTY OF THEIR HOMES, WHICH EACH YEAR DISAPPEARS.